Hamentashen are cookies filled with delightful fillings. These are delightful cookies you can fill with anything your heart desires. These triangle shaped cookies are traditionally filled with poppy seeds, prune preserves, apricot preserves. I have typically with a bunch of other ladies fill these with strawberry preserves, apricot preserves, and chocolate chips. I can honestly say out of all of the cookies in my life, I have made this particular recipe more than any other in my life. Hamentashen are triangle-shaped cookies filled with the most delightful ingredients. They traditionally contain poppy seeds (the oldest and most traditional Hamentashen variety), prune preserves, or apricot preserves. With a bunch of other ladies, I have typically filled them with strawberry preserves, apricot preserves, or chocolate chips. But really, the center can be anything your heart desires. I’m particularly fond of apricot Hamentashen. I can honestly say that out of all of the many cookies in my life, I have made this particular cookie recipe more times than any other. Hamentashen are usually made in the early spring to commemorate the Jewish holiday of Purim. These cookies are named after Haman, the villain in the Purim story as described in the Book of Esther. 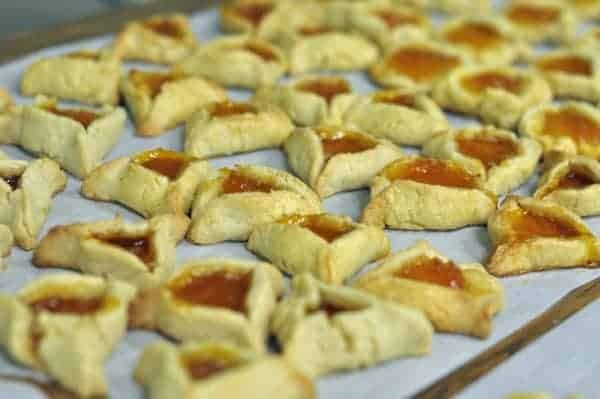 In fact, these cookies are often known as Haman’s Ears and they are supposed to symbolize this defeated enemy of the Jewish people. Knowing the story behind these cookies makes them even more fun and interesting to make and share. You can read more about the history behind these traditional cookies by clicking here. If your dough is coming out crumbly, try adding a little more oil or some egg. My recipe is designed to be parve, so if you want your cookies to be parve, you cannot use butter. 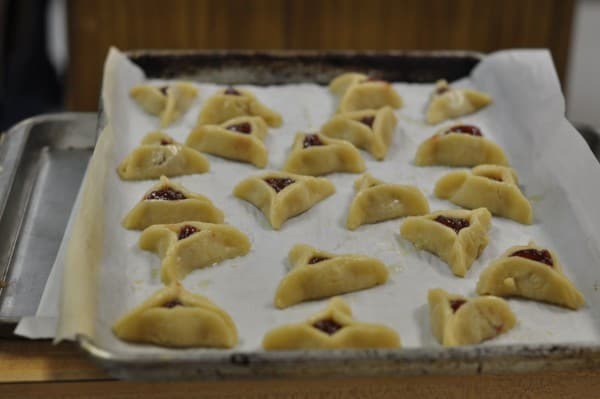 There is something fabulous about holiday traditions, so you may have a different Hamantashen recipe handed down to you from your Great Great Grandmother. For instance, some Hamantash are made with yeast and are much more breadlike. Other recipes add orange and lemon zest. My Russian family wouldn’t consider these real Hamentashen because they are sweet and aren’t filled with poppy seeds or prunes. However, whatever your tradition, when it comes to Hamantashen, it’s all good! For more Hamentashen recipes, click here. You can make delicious hamentashen with this easy recipe. Preheat oven to 350 degrees. Mix together the eggs, oil, sugar, and vanilla, beat until smooth and creamy. Sift together the flour, salt, and baking powder (honestly this makes all the difference in the dough). Add the dry ingredients to the sugar mixer, and blend together. This dough is a little sticky, you may need to add a bit more flour. Knead dough for about a minute before rolling out. Bake in a 350 degree oven for 15-20 minutes until the cookies just begin to turn golden brown. my dough is coming out crumbly any advice? I would add a little more oil to the dough if it is a little crumbly, your other option is to add some egg. Can I use butter in place of the oil? This recipe is designed for oil so the cookies will be parve. I have not tested the cookies for using butter. Do you use all 4 eggs in the dough or 3 in the dough and 1 for the egg wash? 3 eggs to into the recipe, 1 egg goes into the egg wash. They remind me of my Grandma’s date filled cookies which I loved. This is my preferred recipe as I have dairy allergies and my husband is diabetic. This cookie combines the best of both worlds for us. I use low sugar cherry, raspberry & apricot jam/preserves in mine. We love Hametashen! It is nice that this recipe is parve, if you watch which chocolate chips you buy, you can make them with chocolate chips. Lora! – I was just going to leave the same comment as we just finished the Esther study by Beth Moore. What a wonderful coincidence! They were delish! receipe vary depending on what is available when you are making it and the quality of the fruit or the seedamd the diet restrictions if the peop;e eatomgb ot there d sno wrong receipe you make to your taste what is available and the humidity and temperature you bake at. I have seen some Hamentashen recipes that do include orange and lemon zest, all do not include it. Some are made with yeast and are far more bread like. I think your cookies handed down to you by your grandmother had the extra touch of citrus, but this recipe didn’t have that in there. My Russian family wouldn’t consider these real Hamentashen because they are sweet and these aren’t filled with poppy seeds or prunes. There is something fabulous about family traditions they are all wonderfully different. Why not share your recipe, I would love to try those cookies out. Nice Hamentashen. I’m particularly fond of apricot Hamentashen — and Rugelach for that matter. I know these! They’re Hamen Ears. I led a Beth Moore study last summer on Esther and the recipe for these cookies was in the back of the study book. I made these cookies for the ladies who attended…they were wonderful and easy to make. Telling the story behind the cookies made them even more fun to make and share. Thanks for sharing this recipe…I think I’ll make some again this spring!